Welcome to Day #3 of Chocolate Chip Theme Week. Today's Chunky Chocolate Chip Gluten Free Muffins hailed from Flax4Life (Bellingham, WA). Flax4Life offers a line of chocolate and/or chocolate brownie gluten free muffins (as well as other non-chocolate flavors) with flax. They're all quite tasty. Muffins aren't necessary low calorie, but one of these is so satisfying, you won't feel like you need to eat more. 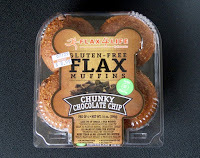 And these Flax4Life muffins with chunky chocolate chips/pieces really did taste better than most other gluten-free baked goods.